Annie Tritt for The Wall Street Journal James Freeman in Blue Bottle’s ‘cupping room’ in Oakland, Calif. Employees taste (or ‘cup’) coffees throughout the day with a spoon. James Freeman‘s first memory of coffee comes from when he was 4 or 5, growing up in rural Humboldt County, Calif. His parents let him open a container of MJB Coffee. He remembers the whoosh as the air rushed from the vacuum-sealed can and the rich fragrance of the preground beans. Waiting is part of the Blue Bottle experience: Mr. Freeman believes coffee gets stale within minutes of brewing, so every cup that Blue Bottle serves is individually brewed. His cafes and kiosks offer no sizes and no special flavors: they generally use beans roasted no more than 10 days earlier. Well-known chefs such as Gramercy Tavern’s Michael Anthony and Coi’s Daniel Patterson serve Blue Bottle at their restaurants. Overall, the company expects sales of about $20 million this year. Waiting in line is part of the experience at Blue Bottle Coffee Company. Founder James Freeman believes coffee gets stale within minutes, so every cup is individually brewed. 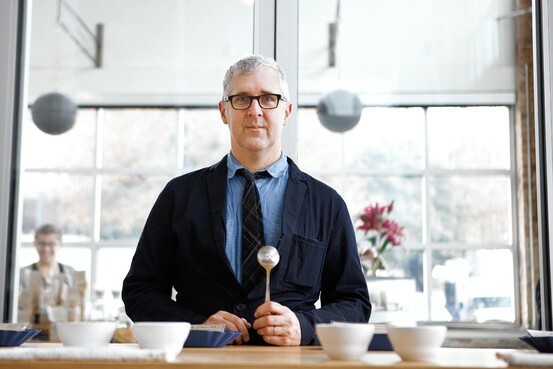 WSJ’s Julia Flynn Siler profiles Blue Bottle’s story. 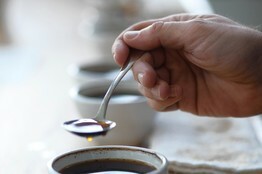 Annie Tritt for The Wall Street Journal Coffee is tasted in the cupping room of the Blue Bottle Roastery in Oakland, Calif. Eventually Mr. Freeman began hauling small batches of his roasted beans to a local farmer’s market. An early break came after he traded a pound of beans a week for a year with a graphic designer in exchange for a folksy logo of a blue bottle for his fledgling company. With the new logo, his coffee bags caught the eye of one of the owners of the cake shop Miette, who decided to serve his coffee at her stand (and, ultimately, married Mr. Freeman). 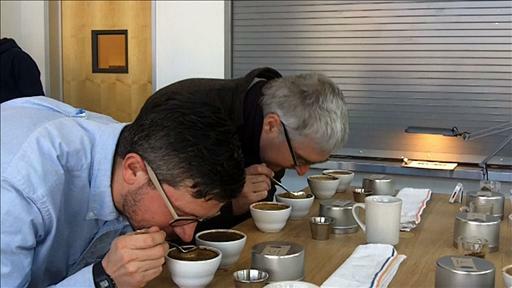 When he is in Oakland, Mr. Freeman meets with his staff each day in the company’s production facility for their “cupping” ritual—a blind tasting of all the coffee roasted the previous day, as well as coffee made from beans they are considering buying. The creative part is to have an ideal in mind for what the coffee should taste like and then working toward it. Annie Tritt for The Wall Street Journal Mr. Freeman uses roasting equipment from the ’50s and ’60s. He has carefully studied Japanese manual coffee-making techniques and has switched to more Japanese equipment over the past five years. Moving more deeply into the culture, he has begun studying the Japanese language, toting his flashcards around and meeting with a tutor about twice a month. Mr. Freeman’s love of Japan has spilled over to his designs for new kiosks and cafes, where he insists on spare lines and an unfinished or imperfect look. It was in Japan that he learned to appreciate the beauty of “a shelf with nothing on it.” The minimalist approach goes back to his first kiosk, which was located in what was then a rough alley in San Francisco’s Hayes Valley when it opened in January 2005. The shop had no seats, and cups came in only one size. 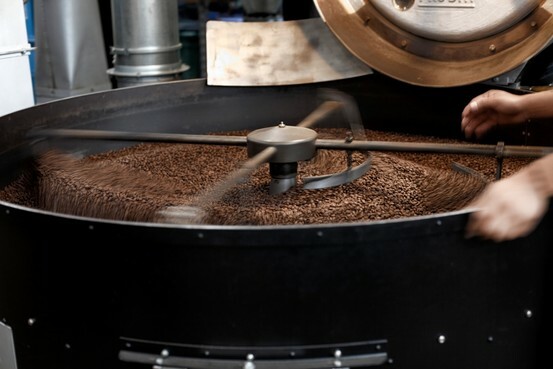 A version of this article appeared March 30, 2013, on page C11 in the U.S. edition of The Wall Street Journal, with the headline: Coffee Beyond the Same Old Grind.